Groovtama for the XPMSE skeleton which I've used as the base for the edits. This is the official version of Racial Body Morphs. I left the legacy version up because it has a lot of distinct features that I'm sure some people would miss. Scroll to the bottom of the page to see the differences between the two versions. This mod diversifies the heights and proportions(Skeleton nif edits using XPMSE skeleton as a base) of all the races in game based on the lore and previous games. Orcs are big and burly, High elves tower above the other races, and wood elves are as short as they were in previous installments. 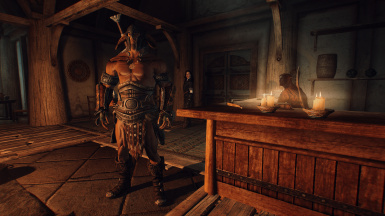 In Skyrim, despite how unique each of the 10 races are proposed to be, and their historical disparity in strength, size, and speed, all of their bodies look exactly the same, and the height differences between them are smaller now then they ever have been in previous games. What I decided to do was to first do a simple rescale of the races to make their height differences more apparent. 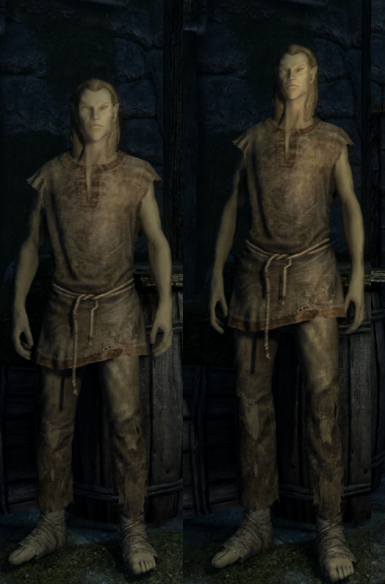 In the vanilla game, high elves stood around 6'4", shorter than in any other modern ES games, and the shortest race, Wood elves, stood around 5'9, barely shorter than Imperials/Dunmer/Khajiit and much taller than they were in Oblivion. Secondly I diversified the genders, making the women slightly shorter than the men. 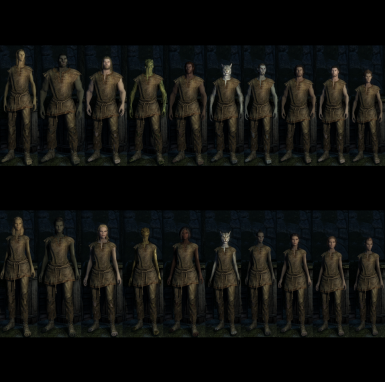 Finally, and here's the most important part, I changed the proportions to make each race have a unique silhouette, no longer will the likes of Imperials, Bretons, and Nords be impossible to distinguish, nor Wood Elves/Dark elves. Now each race has a unique height and proportion fitting to their abilities, lore, and stats in previous games. High Elf: High elves are traditionally the tallest race in Elder Scrolls, towering above the other races. Despite this they are physically weak, with only bretons having lower physical stats than them. In Skyrim they act as a main antagonist to the player, my aim is to make them fit their magical roots better while making them more noble, alien and intimidating. To achieve this they have been given a height boost, standing an imposing 6'9" to 7 feet(A head taller than an imperial), with long legs, a slender figure, and narrower shoulders. Females have been given the same treatment, but slightly shorter at around 6 and a half feet tall. Orc: Orcs by far are the most drastic change, anyone who knows anything about Orcs and their modern fantasy depictions, knows that orcs are big, burly, and strong. 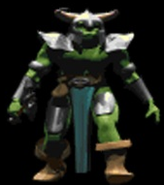 Orcs in game have the most warrior abilities by far of any race, and the strongest power. In previous games they were the toughest race and a go to for when you wanted to wreck the game. 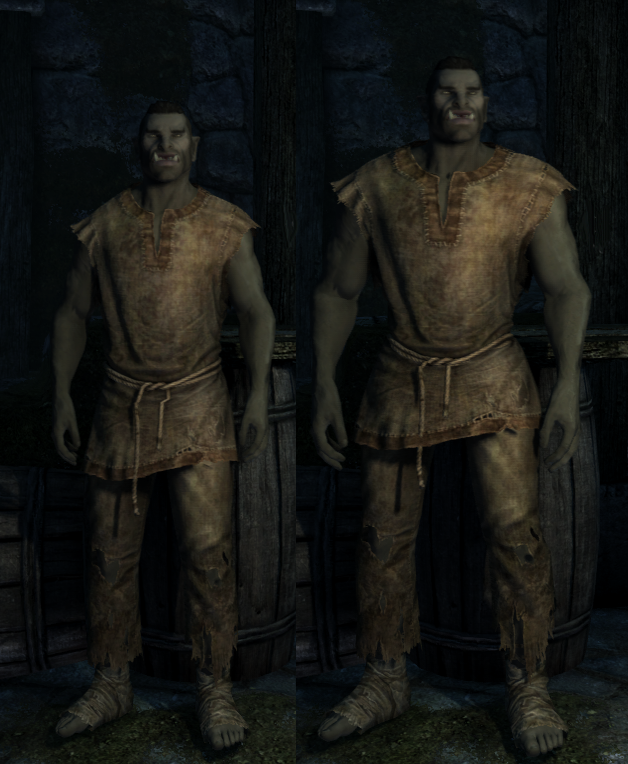 Already the second tallest, the orcs remain shorter than high elves, but still taller than nords. Standing around 6'4" -6'5", slightly taller than in vanilla. IMO a fitting appearance for the all around best warrior class. Argonian: Argonians are historically one of the fastest races in previous ES games. Tall and stereotypically lean, the Argonians favour stealth and nightblade classes, but have the potential to be versatile warriors. Argonian height has been made visually apparent, they've always been a tall race, but it's rarely apparent due to the conservative scaling and unique head shape. The Argonians have been made to look less human with long slender calves and lengthened necks and claws. Their physique is athletic and tall, with longer legs, long slim torsos, and sturdy shoulders. They are built for agility and speed over brute strength. Redguard: Redguards are considered to be the most naturally gifted warriors, diverse, fast, with seemingly endless stamina and a knack for single handed and dual wielding combat. Redguards are around Argonians in height, with long slender limbs and an athletic physique. 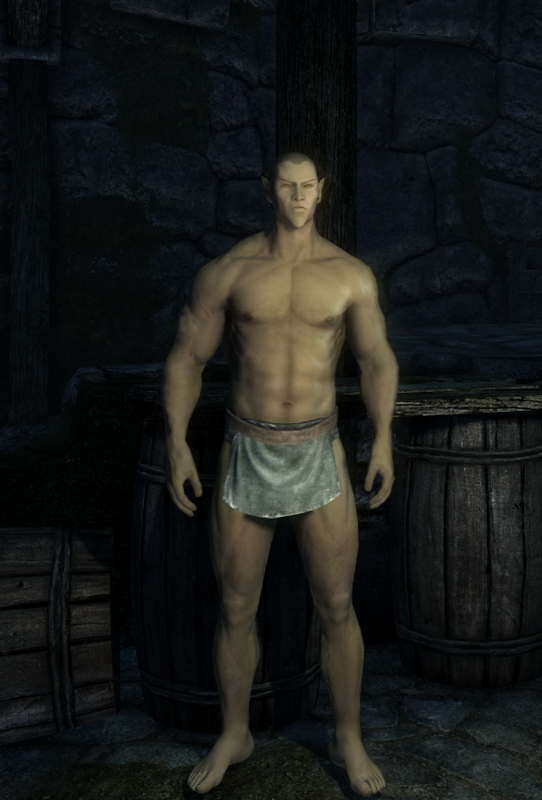 To reflect their speed and warrior nature, Redguards now have broad shoulders, narrow waists, and powerful arms and legs. 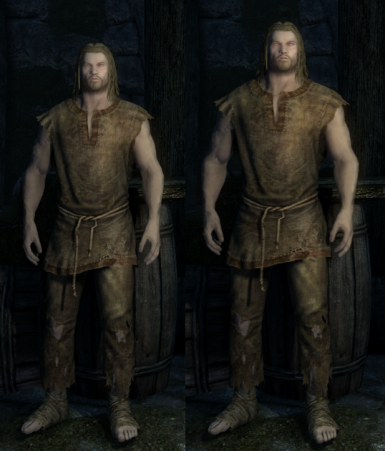 They lean more towards a sprinter's physique than the burly nords or orcs. Dunmer: The dunmer are a proud and long lived race, intelligent and well balanced, they can historically adapt well to any class. I've given the dunmer a more idealized physique, longer legs, narrow waists and a more gracile appearance compared to the more stocky races like Nords and Imperials. They remain of average height, albeit slightly taller than Imperials and Khajiit due to slightly lengthened limbs. They are fit to their mixture of Magic, stealth and small bit of warrior skills and abilities they possess. Khajiit: Khajiit are stealthy and agile, with a larger focus on stealth than any other race. Alongside their agile nature they're also fierce at hand to hand combat, using powerful claws to tear foes to shreds. To represent these traits the Khajiit have been given a sleek and slender frame, with long, uniquely shaped legs with a slight curvature(Not digitigrade), and long arms ending in much larger claws than in vanilla. They look a lot better imo, and don't suffer from oversized heads and dumpy figures like they did in vanilla. Imperial: Imperials have no height change on males and a ratio height change on females, making the women slightly shorter. They are sexually dimorphic, due to the fact that the imperial legion is populated predominately by men. 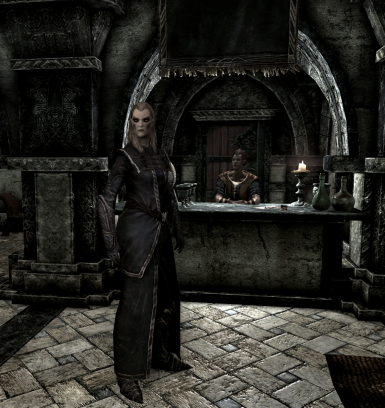 Unlike the Imperials of Oblivion, the Imperials in Skyrim have lost their diplomatic streak, and have experienced years of siege and strife in their homelands. They've lost their bonuses to speech in favour of skills with shield, sword and heavy armor. A tough race, determined to see their empire survive, the imperials are now stockier, with broader shoulders and a sturdy appearance. They make up the brunt of the imperial legion and now look the part. The females on the other hand are more idealized, less likely to be footsoldiers in the legion, but still capable(And often in leadership roles), they have strong figures with long legs and a more noble appearance that shows a strong force of willpower. Breton: The bretons are historically the weakest of all humanoid races, low physical strength, little to no natural affinity for weapons or stealth, and a strong leaning towards the magical arts. Bretons are slightly shorter than imperials, but not as stocky. Slight of build with gracile features, the bretons fit their magical roots much better, having proportions in between elves and men. The breton females are smaller than their male counterparts by quite a bit, as they were in vanilla and the previous games, with a similarly slender appearance. Wood Elves: The shortest humanoid race by far, the wood elves are none the less a scrappy and agile race. Hailing from harsh jungles and favoring the roles of hunters, the wood elves have lengthened bones with strong forearms, narrow waists, and well developed backs and shoulders. Though small, they are not soft. They have the harshest features of the elves, while remaining more gracile than men or orcs. Feel free to offer any critique or desired changes, if not updated in the main file I can add more personal preferences as optional files. Installation and uninstallation: Use the damn NMM, or just drop into data folder. Also incompatible with any mods that edit races. 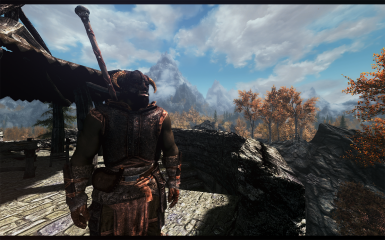 If there's a mod you like, whether a race mod, or a particular skeleton you want to be morphed, simply drop me a link and I'll look into putting up a patch. And thanks to everyone who has provided critique for improving the proportions of the different races. Cheers :D .
Finally, massive thanks to anyone who enjoyed this mod enough to donate, it's greatly appreciated. Differences between this and (outdated) version. Features that are missing compared to the legacy version. -BFQ, There's no optional patch for this mod, as it would require redoing all skeleton edits over again and re-doing them anytime I had a change of design. AFAIK the old BFQ patch was broken anyway. -No installer, I don't know how to make or update these, and I have limited options this time around anyway. Don't bother asking for me to implement any of these old features, they were done by another author/friend on the nexus who has been inactive for a while, as is(With just me) prefer the mod simple like this, easier to update/patch.